Praise for the trip has been unanimous. Some kids have said it is the BEST trip they have ever been on! We provide a bespoke and professional service, offering exhilarating, challenging and educational activity holidays for schools and groups. Our program reinforces the importance of learning outside the classroom, incorporating language, geography, history, PE, citizenship, creativity, individual and collective responsibility, and social skills. 1 day 5 km ‘mini descent’ of the Ardèche river. 2 day, 28 km descent of the Ardèche river, including overnight camping and barbecue at the Gournier Bivouac site. 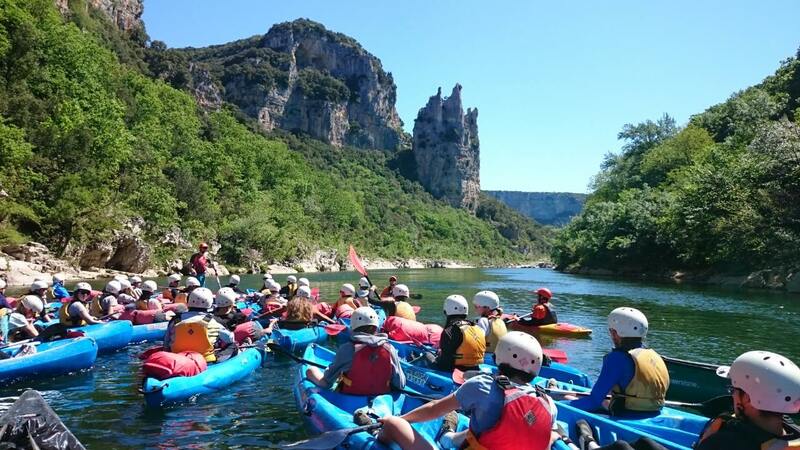 Students will paddle in pairs through one of the most dramatic landscapes in France, with plenty of opportunities along the way to play, swim and picnic. Rock climbing and weaselling. Both activities reinforce team building skills and problem solving. Treetop high ropes course – an exhilarating adventure with zip wires, bridges and swings. A full program of evening activities. All activities are supervised by highly experienced, English speaking, UK qualified instructors. Our varied and exciting program reinforces the importance of learning outside the classroom and reflects our strong commitment to the environment and personal development. We are very proud of our excellent safety record and hold the Learning Outside the Classroom (LOTC) Quality Mark. All of our activity leaders hold UK NGB qualifications and have gone through further rigorous training and assessment with us. Our Risk Assessments and Operating Procedures are regularly up dated and are available to you on request. We keep or instructor to student ratios low to ensure we are always able to fully supervise each activity and give you the best, most enriched experience possible. Most of our school groups choose to stay at a local, family run campsite that we recommend and have used for many years. Here you can choose modern chalet style accommodation, or we can provide tents if you would prefer to camp. Facilities at the campsite include a large swimming pool, restaurant and bar, a small shop, games area, and a tennis court. Other accommodation options, including hotels and gîtes, are available on request and we are happy to discuss these options with you. Since our school activity program operates outside the traditional holiday period, you can be sure that wherever you choose to stay, it will be quiet. We provide all meals from the moment you arrive to departure We can also send you off with packed lunches for the return journey if required. Due to the active nature of our holidays we need to ensure that all children are well fuelled for the adventures ahead.We provide simple yet nourishing, healthy meals that we know the children will enjoy and can cater for any special dietary requirements. 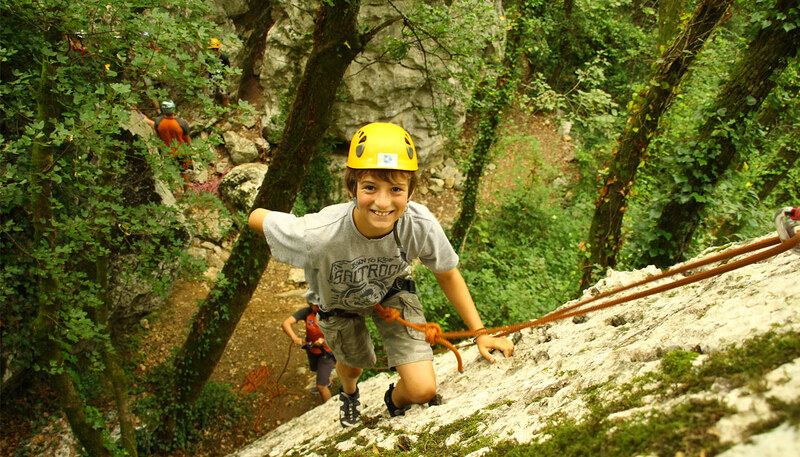 Our Adventure Ardeche site is located in the picturesque area of the Chassezac Gorge, surrounded by beautiful paleolithic forests and wildlife. The family-run site we use is fully equipped with large modern chalets, each with their own toilets and showers. Since we operate our school season outside of the traditional family holiday period, we have almost exclusive use of the site and its facilities. Facilities include: a restaurant area with bar; a table tennis area; boules courts;and a large swimming pool. 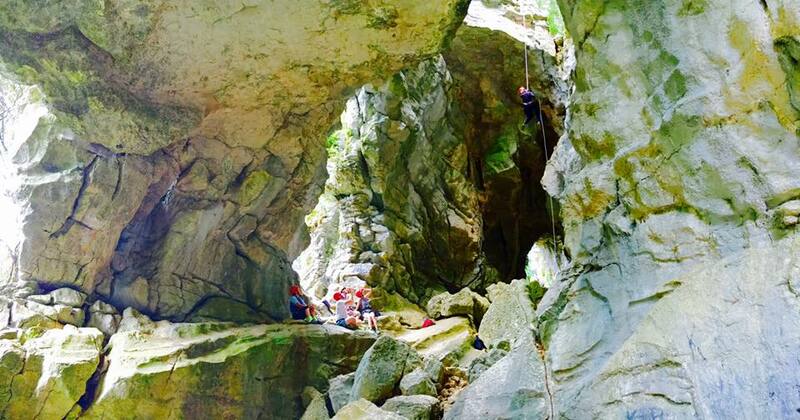 The River Chassezac is just two minutes walk away and we are ideally placed to take advantage of the many beautiful footpaths and nearby rock climbing sites. Transport options will depend on where you are travelling from and your budget. Many groups chose to travel to us by coach and this will give you transport while you are here. Alternatively you can fly to one of the nearby airports or travel by train. We will then organise transport to collect you. However you choose to travel it is worth contacting us to fully discuss all the options. 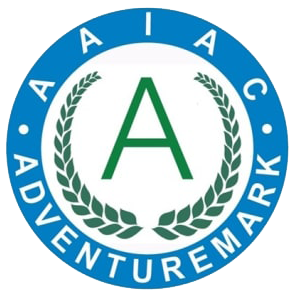 Adventure Ardeche is an English-speaking multi-activity holiday company located in the Ardeche region in the south of France. I developed a passion for paddling when attending canoeing clubs in London and, despite an established career in education, I always found myself drawn back to the Ardeche. So, in 2004, Adventure Ardeche was founded. 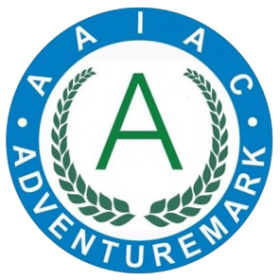 My experience and expertise in providing adventure holidays in this region spans over twenty years. In that time I’ve managed and organised trips both independently and on behalf of UK and French tour operators. 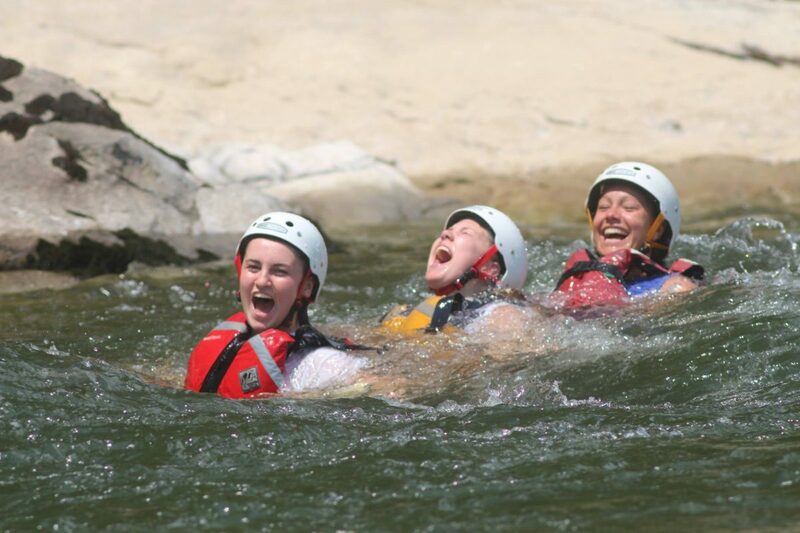 Adventure Ardeche is unique in being able to offer a personal, bespoke service with and a dedicated and professional team of staff. We live here, we are passionate about the region and we are passionate about adventure for all, no matter what age or background. We will be personally involved at every point of your trip, from the moment you book to being your group’s guide down the river. We are proud to be able to provide continuity and quality of service. Do all the children need to be strong swimmers? 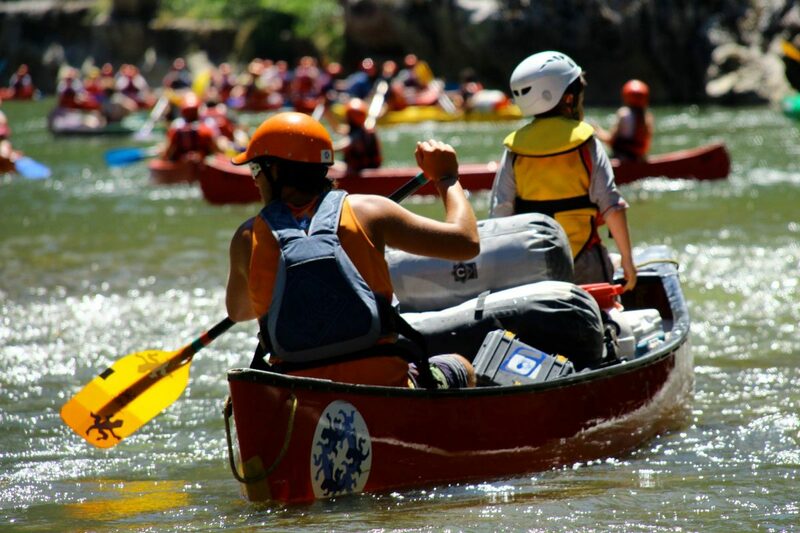 During the descent of the Ardèche River you will all be required to wear a buoyancy aid whenever you are near the water. This will keep you afloat should you fall in. We are able to look after non-swimmers but we do ask you to let us know if you are not confident around water so our instructors can give you special help if needed. What group size can you accommodate? We regularly host groups from 10 to 80 children and can cater for even larger groups if needed. Will we be the only school staying with you? Depending on when you choose to come you might find another school here at the same time. We keep the activity program totally separate and also provide meals at different times. The accommodation is flexible enough to ensure schools have their own areas and separate use of the swimming pool. Our staff come from all round the world and are either native English speakers or have a very good level of English. Do the children need to bring money? A small amount of spending money is a good idea as there is a shop at the campsite which sells ice creams, drinks, and snacks. Subject to your chosen activity program, there is usually the opportunity to buy other souvenirs at the local town or market. Safety was so obviously high on the agenda but without any fun being lost. One of the best experiences ever. All the kids have done is talk about it and are looking forward to next year. You guys exceeded our expectations on every aspect of the trip… Incredible. We are so keen to return next year.